I got behind in posting because I was so busy that I wasn’t doing any sewing/quilting to blog about, but I’ve been sewing a lot the past week and a half. I kept putting off blogging because it seemed like writing a post was this huge task that loomed in front of me. Not sure why I thought it would take so much time/effort, but that’s why I’ve been suspiciously absent from my blog. The good news is I’ve been working on lots of stuff so I have a lot of projects to post about! This one had 2 batting layers: the bottom batting was Fairfield’s bamboo/cotton blend and the top was Quilters Dream polyester. 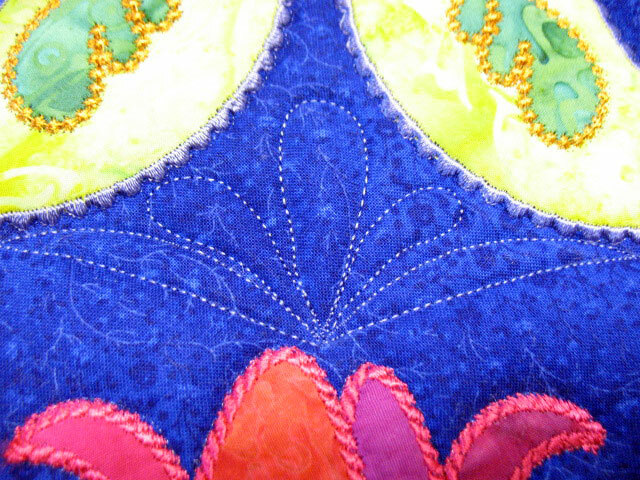 People ask me why one might do this and for me, it’s all about creating more texture with your quilted lines. 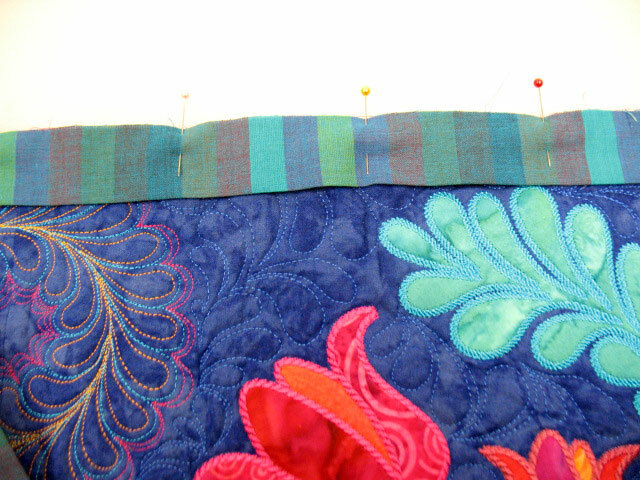 The bamboo/cotton blend is wonderfully soft and has a lovely drape but the quilting comes out looking very flat. I don’t want to waste my stash of battings like these, so to use them up, I place them on the bottom layer and by adding a thin polyester batt on top, I know I’ll get a beautiful texture. 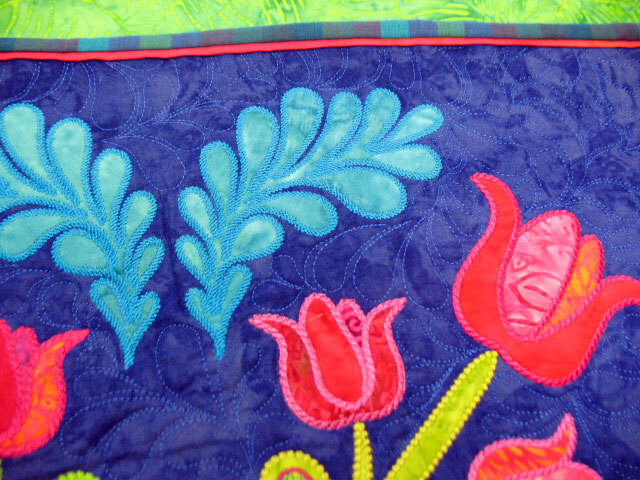 These photos won’t show it, but this quilt came out with incredible 3-dimensional texture. Oh yeah, baby! Now that’s a perch! 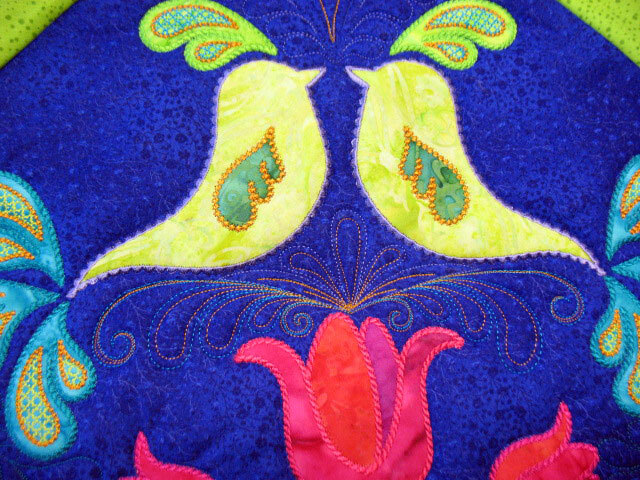 I quilted feathers emanating from the tail feather area of the appliqued birds and then quilted the background fabric in dark blue thread. 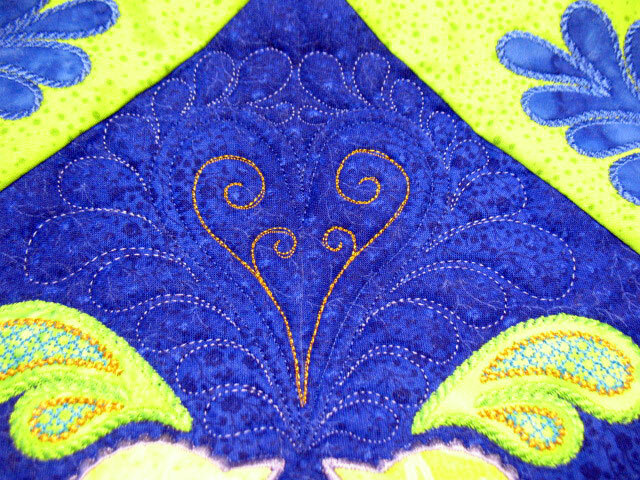 You can’t see any of the background quilting on any of these photos but it made all the applique shapes really protrude out. 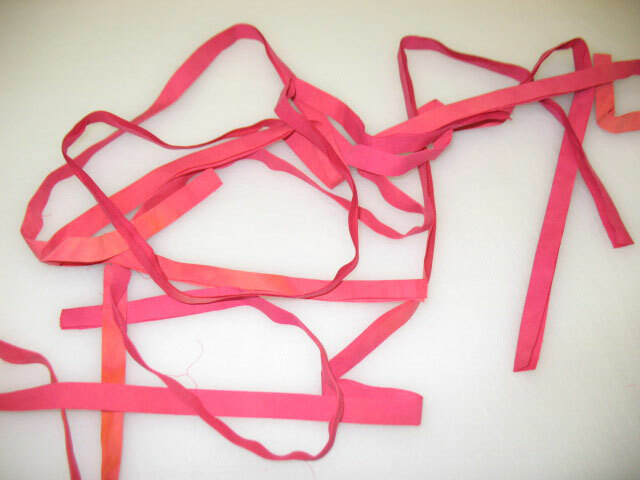 (Sometimes using a double batting layer will give a trapunto-like effect.) 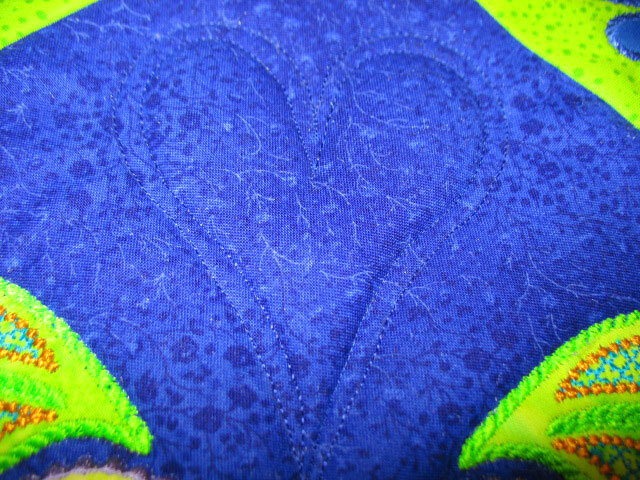 It still wasn’t quite right, so I hyperquilted the plumes and re-stitched the heart lines in magenta thread so it would show up better. I did a swirl design in the green corner blocks and now all that is left is adding the binding! And on to the next project! Eureka-I Can Post Photos Again! But most of all, I’m glad to have a completed project before the end of the first week of the new year! 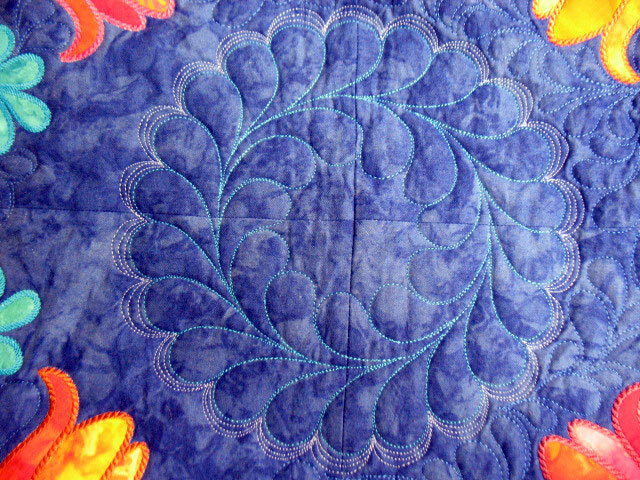 Jenny’s sister Helen has a wonderful blog called HGMRdecoquilting.com Helen is also quilting up a storm using the Quick Curve Ruler and she’s also creating quilt blocks for the quilt along. 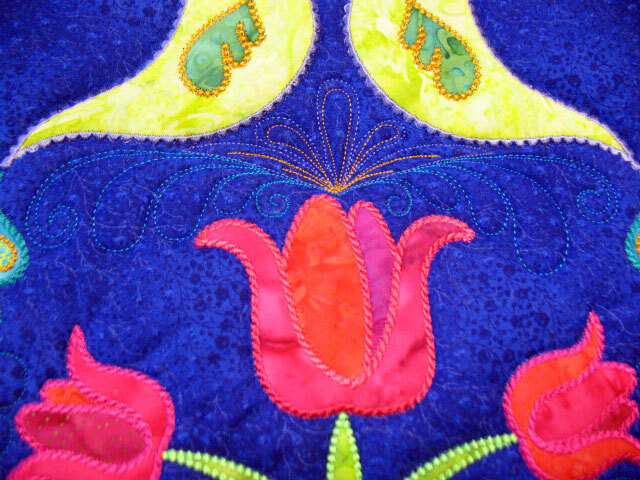 Again, if you’re into machine quilting, scroll backwards and drool over all the lovely quilting Helen has done and check out the fabulous creations using curved piecing. I’ve had the ruler for a month but haven’t had time to make anything yet, but these 2 women have me sold on their designs! 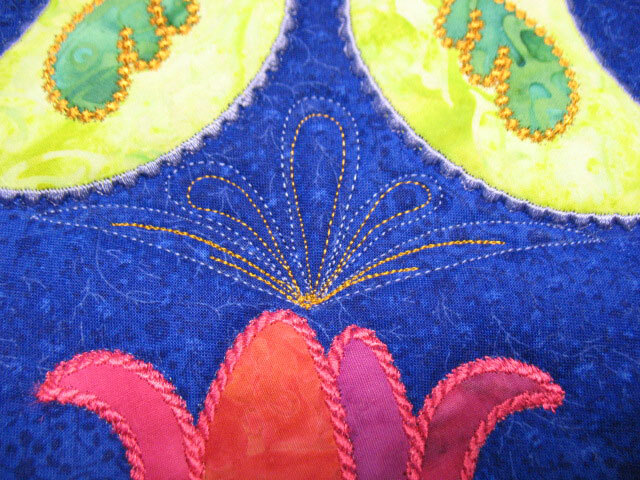 Another great blog for machine quilting is the Quilting is my Bliss blog of Teresa Silva. 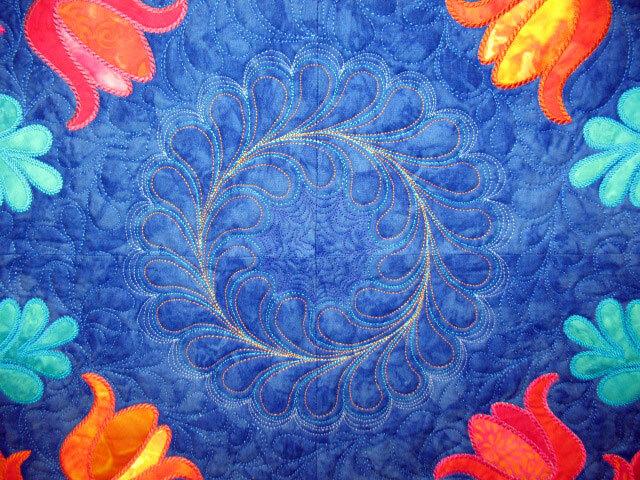 Eye candy for quilters is all I can say! 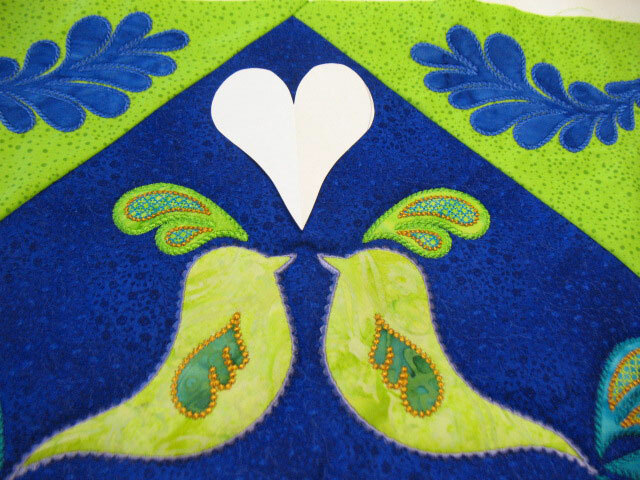 Two more blogs that I love that you probably already follow but feel I must mention are Judy Madsen’s Green Fairy Quilts (check out Judy’s 1/4/13 post for sure!) 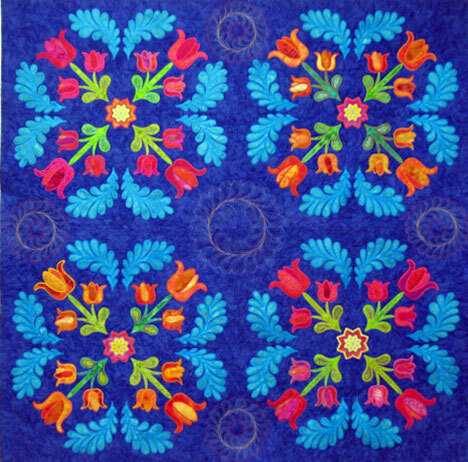 and Quilting is my Therapy Blog by Angela Walters. 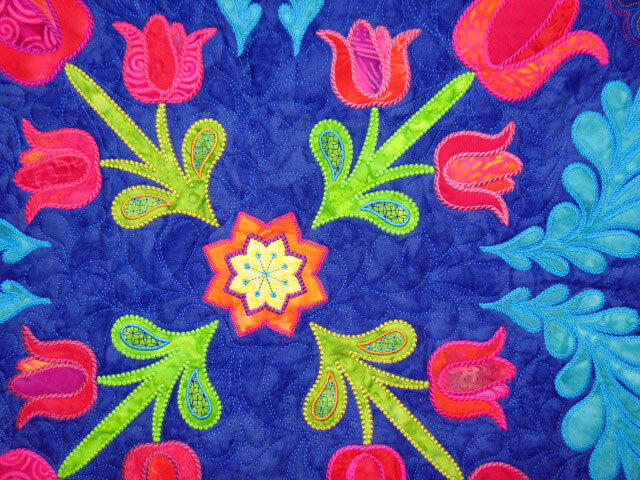 There is so much machine quilting inspiration out there that it’s a wonder we can drag ourselves away from our computers and actually QUILT! 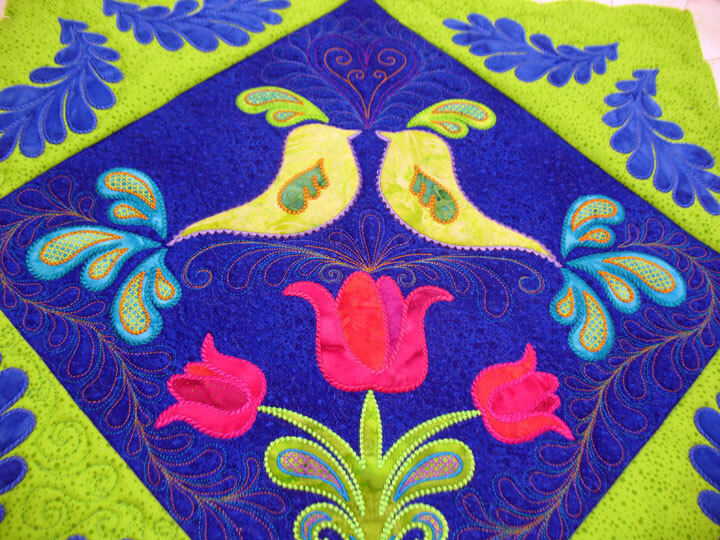 Here’s hoping that I can figure out how to reconfigure this version of wordpress so that I can post some quilty photos on my blog again sometime soon!